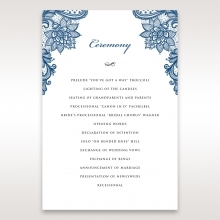 This wedding invitation provides you with a formal, elegant, yet understated way to communicate with your guests. 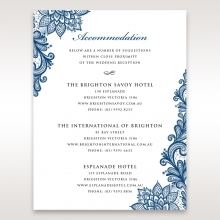 The trifold card has an interior pocket for the RSVP, Wishing Well, Reception & Accommodation cards which are ordered separately. Crafted from a heavy weight pearlized navy cardstock, the card is closed with a silver foil seal. 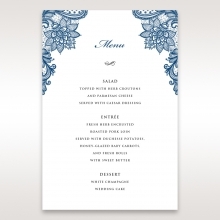 The insert with the wedding details is fully customizable. You can choose your color, as well as the wording text, layout, and even the font. 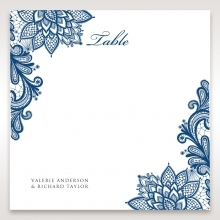 You will also find intricate floral stamping on the insert, and all details are printed in raised ink. The Stationery Suite is similarly stamped, with navy details in the corners. Cover PAPER: Pearl Navy 230GSM. Not Customisable. I really liked this style. 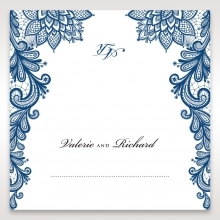 however i wasnt a fan of the place cards there wasnt anything wrong with them just my own personal taste. Still think it is very classy and it comes with different color options! I am totally pleased with my wedding invitations. They are absolutely beautiful with amazing quality. The jacket is amazingly beautiful, and the best thing is that matching cards go into the side of the cover. 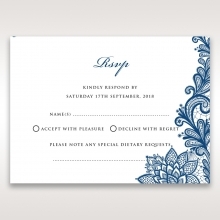 I ordered RSVP, reception and direction cards. They all came with the same design as the invitation, and the whole set looked so fancy and formal. So many people have commented how impressed they were with my invitation set and asked where I got them. I’ve given so many referrals, I lost count. I found this site through Google search and I'm so glad I did. These pocket invitations are totally awesome! I love the adorable mini enclosure cards, they're really pretty. I also love the free assembly part. I think this is the only invitation store on- or off-line that does assembly at no cost. It's fantastic. I would highly recommend this invite and this site to all my friends! terrific wedding invitation! Excellent quality and prices. Highly recommend!!! these pocket wedding invitations are absolutely fantastic. I showed the sample to my fiance, and he just loved it. We’re placing our order and the only problem is choosing the right color combination. I highly recommend these pocket types for those having a big wedding like us, with lots of out-of-town guests. When I found this web site, I instantly knew this was it. Beautiful collection with high quality and the customer service was helpful. I was very impressed with the paper quality especially. The glossy pearl papers really make the invitations look elegant. My advice to everyone, get a sample and see it for yourself. I highly recommend!! I searched long and hard for that perfect invitation and came across this site by pure luck. 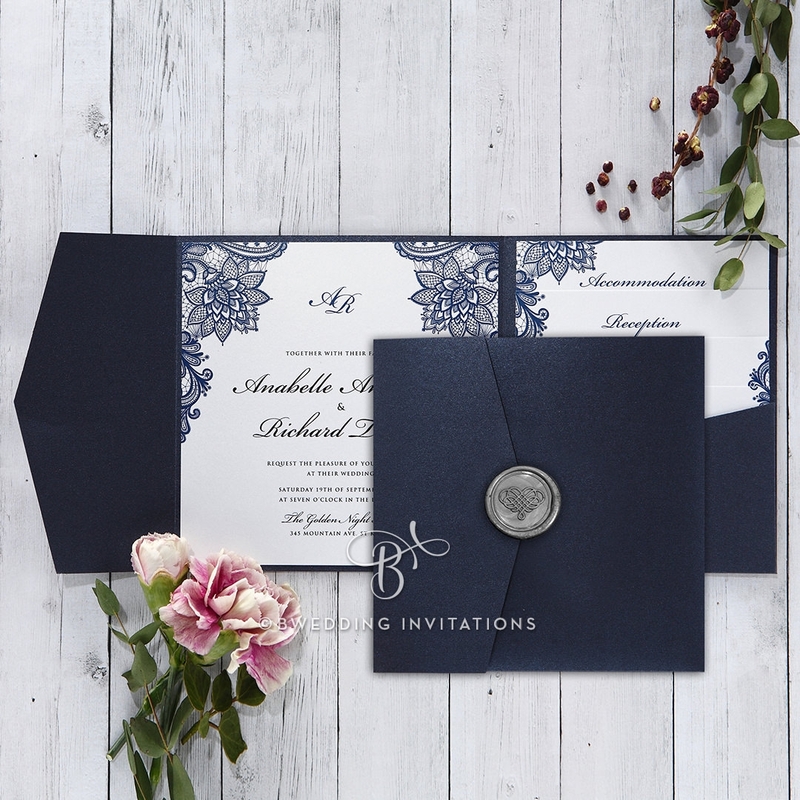 I had never seen an invitation & enclosure set like these before, so after seeing the sample I shopped around for pocket folds at other sites, but their products didn’t match up to Bweddinginvitations. The quality is really good. I highly recommend this product and this site. Just received my invitations and they’re stunning. I ordered the blue set which is really beautiful and very formal looking. I used different script for the initials and it came out great. The pearl paperstock is of really high quality and everything was assembled perfectly. I would not have ordered this particular invitation without the free assembly since I could never put together anything that requires fine dexterity. Overall, great invitation and fantastic service! I got my invitations and they're perfect. Ordering process was simple and nice and my invitations came out beautifully. I can't thank BWeddinginvitations.com enough. Great Job!!! I wanted to use green to match my wedding color but didn't like the particular green they offered. Still, I really liked the design, I went with the blue one. The quality was consistent with the sample and everyone that received my invitation told me it was beautiful, so I guess it all worked out. Overall, decent product & price. I've finally found what I've been searching for weeks. Nice invitation with decent quality. I love the pearlized paperstock. The price is fantastic with free assembly and other discount offers. Highly recommend!! Just received a sample of this product and had to write a review. This invitation set is actually better in person than how it looks online. I’ve ordered many samples from different places and was disappointed with most of them. 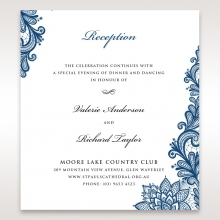 But, this time I was really pleased and impressed with the quality and the style of this invitation. this invitation is absolutely gorgeous as well as original. I’m totally in love with my invitations. My fiance was a bit worried at first but he’s happy and agrees that this was a good choice. Beautiful and unique! We wouldn’t have had it any other way! I just got the sample order for this product and had to write a review. It is beautiful. I love the colors and the glossy papers. I'm really excited to place my order. Can't wait to see my name on them. I'm ordering response cards, thank you cards and direction cards for now, but I may also get table cards and program with different colors. I'm really happy that I found this design. My invitations will be perfect! I just received my invitations and they are awesome! My fiance and I wrote our own verses, and I was worried that it wouldn’t fit nicely, but they came out exactly like the proof they showed. Printing is of very high quality. 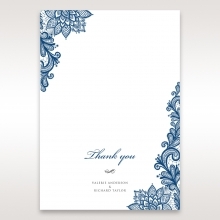 I’m going to order thank you cards from Bweddinginvitations, and I recommend their products to anyone shopping for wedding related inviations. My invitations were a big hit! The price was surprisingly low compared to other companies. I'd definitely give 5.0 and recommend this site to all my friends. I like the simple but elegant design of this invite. The pricing seems reasonable. I might have found the perfect invite for my wedding without breaking the bank. stunning wedding invitations!!! I just got my order last week and they’re far better than expected. Since I changed the font style I wasn’t sure how it would look, but everything looks gorgeous and the quality of printing (especially thermography) is superb. My mom and fiance approved wholeheartedly and I can’t wait to start mailing them. Highly recommend this invitation!!! I was hesitant at first to order something so important online, but they came out exactly as I wanted and I’m really happy. 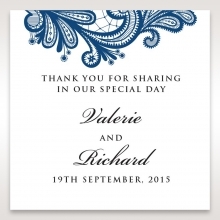 I received so many compliments, even from people who spent way more at offline shops for their wedding invitations. Everyone thought this pocket style was brilliant. I highly recommend this product. 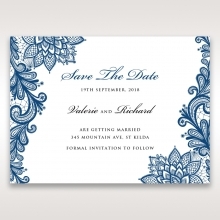 Best wedding invitations online. Excellent quality with great design, and I just love how response cards and reception cards have different pictures, but when you place them in the pocket they fit like puzzle pieces and make a perfect picture. Really unique and special product! 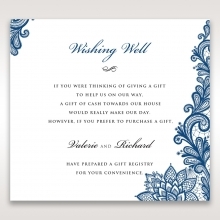 When my fiancee and I were picking out invitations, he was very hesitant to order them online. He called customer service who went over everything with him, happily answering all his questions. After speaking to someone over the phone, we were able to move forward with the process. He couldn't ignore their amazing prices and superb quality. The whole process took less than a month. Im definitely excited to start sending these out to all my friends and family. I looked forever for the perfect invitations but nothing seemed quite right. Finally I stumbled onto Bwedding and I found the perfect invitations! When I got them in the mail I was just so thrilled! They were absolutely gorgeous! Wonderful invitations with so many designs and options to choose from! Best prices around! so many designs to choose from and all of them have top quality paper. I couldn't decide between the samples I got and I finally settled on this design, and I was very happy with my choice.